2. Beat the butter and sugars together in a mixing bowl – either with a wooden spoon, handheld electric whisk or freestanding mixer and paddle attachment – until the sugar is well dissolved and the mixture is fluffy. Beat in the yoghurt and eggs. Sift together the flour, cocoa powder and bicarbonate of soda, and fold in until well incorporated. Pour over the Guinness and fold in until just amalgamated. 3. Divide between the sections of the tin, and bake for 15–20 minutes, or until a skewer inserted into the centre comes out completely clean. Remove from the oven and allow to cool in the tin until cold. 4. To assemble, trim the tops of the cakes to flatten them if they domed over the edges of the tin while in the oven. Spread the jam over the long sides of each strip of cake that will meet, reserving a little jam for later. Stack them together evenly. Refrigerate to firm up while you prepare the icing. 5. To colour the icing, knead the fondant a little to soften it, then add a dab of colour – a cocktail stick is best. Knead the colour in – you may want to wear rubber gloves for this. Add more colouring until you have the desired depth of black. 6. Roll the fondant icing out on a board dusted with plenty of cornflour (icing sugar makes fondant icing crack) – you need it to be long enough to cover the length of the cake, and wide enough to wrap around it, with a little spare just in case. I find using two lengths of string to be the easiest way to measure it. 7. Retrieve the cake from the fridge and spread the remaining jam over the sides. With the short edge of the fondant closest to you, place the cake horizontally on to the icing. Roll the cake up the icing, taking the icing with it. When you get to the icing join, trim the surplus icing and make it look as neat as possible. Turn it round so that the seam of the icing is on the bottom. 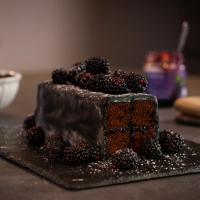 With a sharp serrated knife, trim the ends of the cake to neaten and expose the black bricks of cake. 8. Top with a pile of blackberries and dust with icing sugar.